Expansions Announced for Legendary™: A Marvel Deck Building Game! Legendary™ has been a great success for both the Marvel brand and Upper Deck Entertainment as the game continues to perform well at hobby and retail levels. The success can be attributed in part to the Marvel license, a brand that resonates with a vast amount of consumers, as well as the incredible amount of rich content that comes inside each box of Legendary™. That said, here at Upper Deck we always want to offer even more to the players and with that in mind, our team is already hard at work on the first expansion for the game. 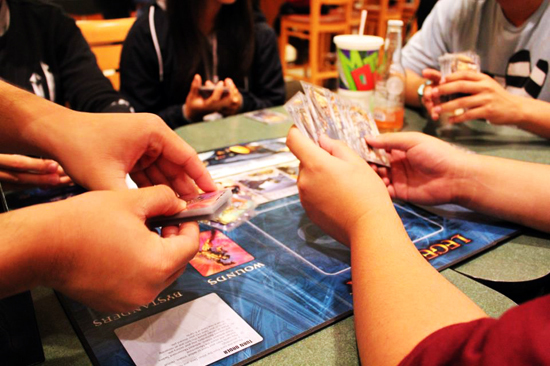 Marvel fans have been getting together in droves to play the new Upper Deck Entertainment deck building game called Legendary! And because of the game’s early success, UDE will be releasing expansions! By no later than August 2013, Upper Deck Entertainment will release the first “Big Box” expansion, followed by a “Small Box” expansion. The Big Box release will occur at the same time each year (every August) and the Small Box release will occur every 3-4 months thereafter. This format, known as “A Legendary™ Expansion Release Timeline” ( A.L.E.R.T) will allow for fresh content to be released year round, providing players with the very best content Marvel has to offer. Content wise, the Big Box will feature up to 350 cards including heroes, villains, masterminds and schemes. This set will release once per year and will revolve around a major event from either the past or the present Marvel lineage. The Small Box will feature up to 100 cards and will be focused on new teams and villain groups, and of course those all important schemes. These expansions will provide year round content that players will see regularly on store shelves. 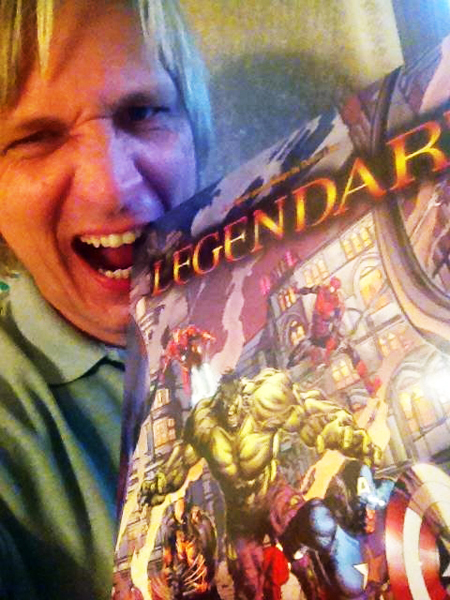 Another Marvel fan who can’t wait to rip into his box of Legendary and start playing! While we will not be sharing specific content on the Big Box and Small Box releases at this time, I decided to use my captain’s prerogative and give you a little peek behind the curtain. That said; look for X-Force and Marvel Knights to be making an appearance in our August expansion. And there will be more surprises to come as players continue their quest to become Legendary™. When the cat is away, the mice will play. 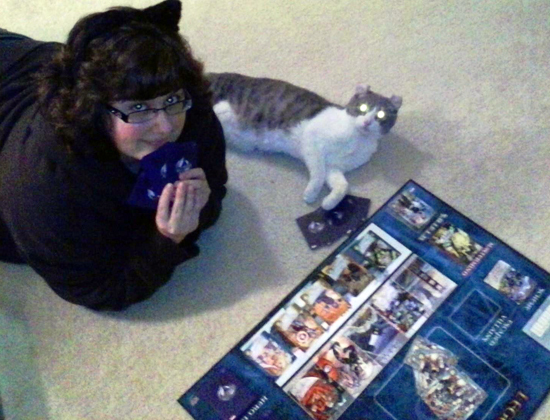 But when the cat is home, he is playing Legendary! That guy is ready to rip some Villains!!!! Maybe you could send him a test copy of the new Expansions! this game looks awesome whens it being released in the uk ?? Don’t expect an official UK release any time soon … if ever. That is what I have been told by many, many retailers, as well as by several wholesalers and distributors, here in the UK. I bought my copy from Funagain Games in the US … they got it to me in about 6 days from the day of ordering. whoa.. the first expansion won’t come out for nearly a year after the game? or is there a small box expansion coming in 3 to 4 months? If the first expansion isn’t for a year, the game’s momentum is going to die out pretty badly before then. I just bought the legendary game this weekend after my friend bought the dc deck building game last week. I enjoyed the dc game but felt it was a little rushed and the mechanics could have used some minor tweaking, nothing that makes it unplayable. After picking up the legendary box at our local game store it was an easy decision to buy with over 4x more cards than the dc game I figured it was like you gave us two expansions and to have a game I can play solo and enjoy almost as much as when the group is together is unheard of. I am very excited to hear of how you will be releasing expansions and I eagerly await purchasing them thank you very much for putting out such a top notch fan service such as this game. This has become my favorite deck building game and I introduce it to everyone I can. I am really looking forward to the next expansion. This is a great game! Enjoying Legendary a ton, and the release schedule should mean that we’ll be getting a new influx of stuff before we can start to get too comfortable with the already large number of permutations the original game offers. Being a fan of deck building games, I really enjoy the variety that this one offers, and look forward to how future expansions expand on that. The Marvel Legendary game is Awesome! Very Very happy with how it turned out. Overall, I understand how waiting months untIl the expansions arrive is a bit of a time stretch that drives most (me) a bit daffy, I realize that the end result will be a total joy in giving us all a chance to play a really great game. Excelsior! I would like to see the Black Panther is an expansion. Is there any news on the characters that will be introduced after the Dark City expansion?